We have a strong following for Geoffrey Key paintings, sculpture and drawings. We offer a free valuation service to people who are considering the sale of their items through our auction room. Click the button below to complete our short form, and one of our experts will be in touch. Geoffrey Key was born in 1941 in Rusholme, Manchester, and has lived in Salford for over 40 years. He is regarded as one of the UK’s most important contemporary artists, and is almost as well known for his flamboyant personality as for his work. His paintings are heavily influenced by the school of European Modernism, and he is best known for his bold use of colour, fine draughtsmanship and strong imagination which have resulted in some striking, surreal compositions. Although Geoffrey Key is most famous as an artist he is also a talented sculptor, having taken a postgraduate course in sculpture at the Manchester Regional College of Art. 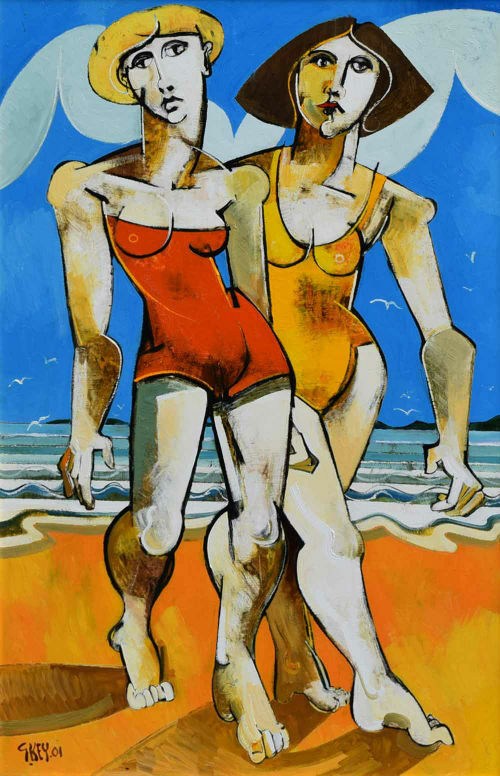 Geoffrey Key’s strong, dynamic figures and dreamlike compositions have considerable appeal, and as Key is regarded as one of the most influential of British living artists the market for his work remains buoyant. His use of form, texture, light and colour are masterly, and have led to his work featuring in public and private collections across the world, including Hong Kong, France and his adopted home town of Salford. His one-man shows have been held on four continents and he’s received considerable media attention in books and articles. The value of Geoffrey Key’s work varies enormously according to the provenance, size and subject matter. His subjects range from strongly-coloured, vibrant landscapes to pierrots and everything inbetween. Geoffrey Key is also known for his technically brilliant still life paintings, which prove very popular at auction. Auction prices for this artist can vary from £500 for a small sketch up to £15,000 for a large painting of horses and riders. At Peter Wilson’s, our in-house expert Stephen Sparrow has years of experience in assessing and valuing Geoffrey Key’s work, so do get in touch if you’d like to learn more about a piece you own, or discuss a potential sale or valuation. On the right of this page you will see a few highlights of Geoffrey Key paintings we've sold - to see more, including prices and dates, search our sold lot archives. Geoffrey Key, "The Grandstand", oil. Geoffrey Key, Fool's Cap, oil.